The UNH chapter of the National Society of Black Engineers is on a mission to, among other ideals, promote its members’ involvement in the community. So when the nearby Greenland Central School contacted UNH to seek help with its Engineering Day, the organization jumped at the chance. 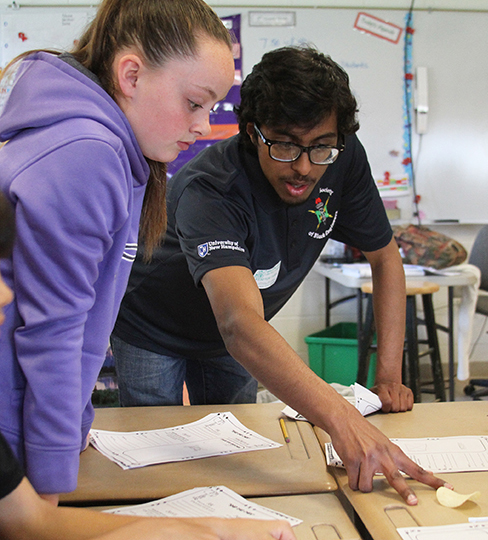 Fifteen UNH engineering students, all members of the UNH chapter of NSBE, spent the day with 150 fifth through eighth graders on April 24, leading engineering activities, answering questions and sharing their passion for science, technology, engineering and math, or STEM. It’s the type of involvement former chapter president Thomas Kroll had envisioned when he first joined the NSBE executive board. Kroll’s referring not only to the successful engineering day at Greenland school, but also to other recent successes the chapter has enjoyed, including being recognized as the NSBE Region 1 Collegiate Chapter of the Winter and dramatically expanding its membership. Members of the chapter credit a strong sense of family for the recent success, and they credit last year’s executive board with creating the family dynamic. 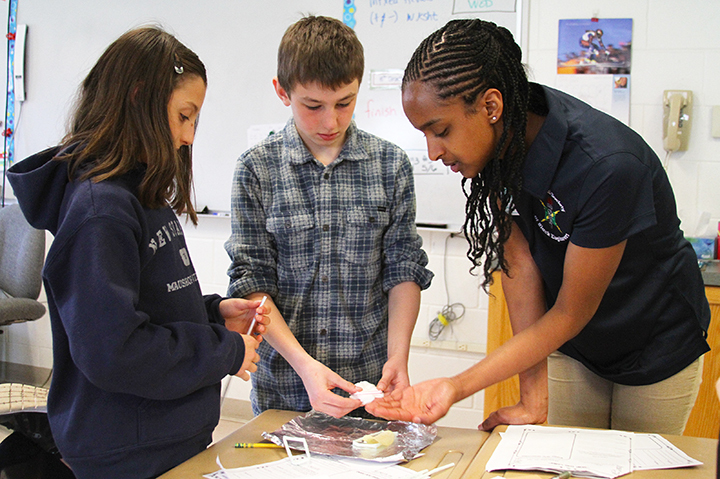 UNH engineering student Salimah Hussien with students at Greenland Central School's Engineering Day. “Home” is quite a distance from Durham for many NSBE UNH members, who hail from more than a half dozen countries across the globe including Ethiopia, Tanzania and Colombia. Outgoing NSBE president Siddarth Nigam is from India, and incoming NSBE senator and bioengineering major Salimah Hussien came to UNH from Ethiopia. She knew no one on campus when she arrived in August 2014, and she credits NSBE for her quick integration into the UNH community. That comfort level is felt by Nigam, who was already active in other student organizations when he joined NSBE last spring. He says the group has struck a balance between supporting one another and holding one another accountable. Professor Carmela Amato-Wierda says she has been impressed with the group’s progress in the two years she has served as faculty advisor to NSBE. The long hours logged by Kroll and a few others building the chapter’s infrastructure during the 2013-2014 academic year have paid off, she says, and the group’s commitment to selflessness, acceptance and respect among its members has been a catalyst for academic and professional successes. Amato-Wierda says many began to take notice of the positive energy and professionalism displayed by NSBE members at events such as the UNH Astronomy Festival and the First Robotics district competition in March, where members served at volunteers. The UNH chapter of the National Society of Black Engineers exists to provide academic, social and professional support as well as community service opportunities for multicultural students in science, technology, math and engineering fields in order to increase the number of responsible multicultural students in the STEM fields who excel academically, succeed professionally and positively impact the community.